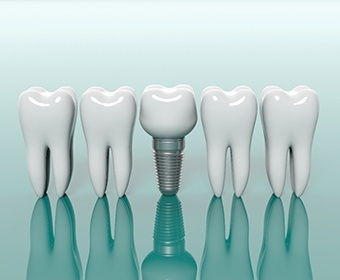 In the world of dentistry, dental implants truly do stand alone. They are the only treatment that replaces an entire tooth from root to crown, and they offer the most natural-looking and longest-lasting results available today. Basically, getting them is like getting your real teeth back. At ProSmiles Dental & Orthodontics, we’ve used this state-of-the-art solution to help countless patients restore both their oral health and self-confidence and no matter how many teeth you might be missing, we can do the exact same for you. To learn more, contact us today for a consultation. Why Choose Us for Dental Implants? Because dental implants are built just like natural teeth (with a prosthetic root on the bottom and a crown on top), they are extremely stable, much more than typical restorations that only sit on the gums or lean on neighboring teeth. With them, a patient can eat whatever they like and not have to worry about annoying slippage. 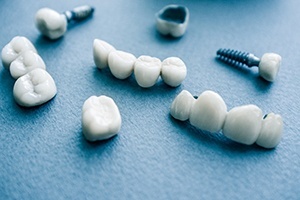 Implants are typically topped with custom-made porcelain restorations, which means they’re able to perfectly mimic the shape, size, and color of natural teeth. Only you and your dentist will be able to tell which teeth aren’t real! Jawbone deterioration is very common after tooth loss, and dental implants are the only treatment shown to stop and even reverse this process. 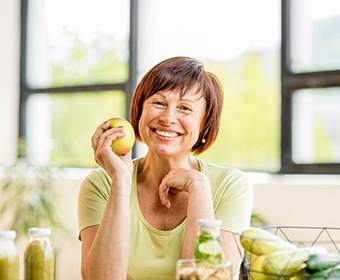 This not only helps maintain a strong foundation for the remaining teeth, but it also helps a person enjoy a more youthful appearance as the years go by. When it comes to durability, nothing outclasses dental implants. They can be trusted to last for around 30 years, and for many patients, the rest of their life. Traditionally, when replacing a single tooth, the two surrounding teeth would need to be filed down in order to support the new one. With a dental implant, however, we can simply place a prosthetic root along with a porcelain crown between two healthy teeth without disturbing them at all. 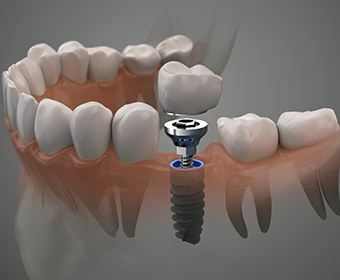 Dental implant crowns can be placed throughout the mouth to restore nonconsecutive missing teeth, or just two can be used to support a bridge that replaces up to 4 teeth in a row. Compared to a traditional bridge, implant bridges not only look more natural, but they have a more reliable fit as well. Even patients who are missing several teeth can benefit from dental implants, as a denture can be attached to the jaw using just 4-6 new “roots.” Implant-retained prosthetics have a firm fit that completely outclasses traditional removable ones, and they even help patients recover more of their biting strength as well. Every dental implant procedure must begin with the new implants being placed into the jawbone, and this involves minor surgery. Other dental offices in White Settlement send their patients to outside specialists to have this completed, but we’re able to handle the entire implant treatment from beginning to end here at ProSmiles. From your first consultation all the way to when you walk out of our office with your renewed smile, you’ll be able to work with the same dentists and team that you trust, helping you save time, money, and stress along the way. 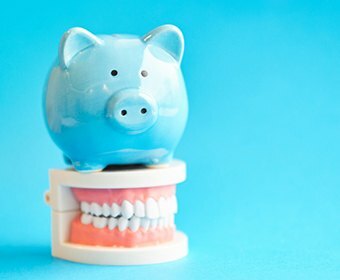 Dental implants are able to help patients with a wide spectrum of tooth loss, and because of this, the cost of every procedure is unique. Factors like the number of implants, what kind of restoration is used, and where they will be located in the mouth can all affect the final price. For instance, replacing the front teeth usually costs a little more due to there being less bone and more aesthetic concerns. While implants are certainly an investment, we believe they are one worth making. In addition to offering superior function and aesthetics compared to all other options, their durability practically makes them a bargain. 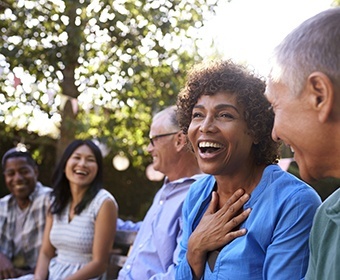 While regular bridges and dentures will need to be replaced every 5-7 years at most, dental implants can easily last for multiple decades with only minimal maintenance. Over time, most implant patients end up saving thousands by comparison.